Trump will travel to Laredo, Texas on Thursday. Republican presidential candidate Donald Trump finishes up speaking before a crowd of 3,500 Saturday, July 11, 2015, in Phoenix. 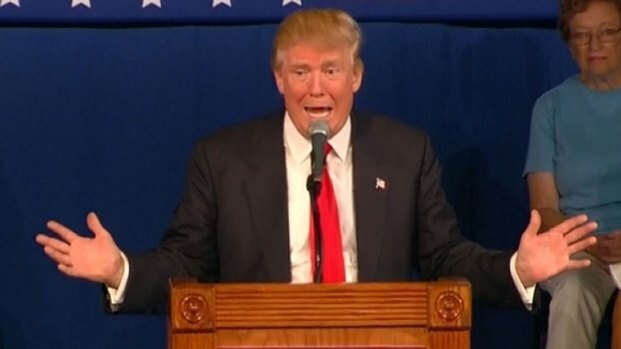 Donald Trump has announced plans to visit the Mexico-Texas border this week, a trip that comes as he continues to condemn illegal immigration and lashes out at critics who have become increasingly critical of the Republican businessman's presidential bid. Trump will travel to Laredo, Texas on Thursday, where he will hold a press conference at the border and meet with members of the union that represents border control agents, his campaign said Wednesday. The billionaire reality television star plans to address the law enforcement community at a local reception hall. 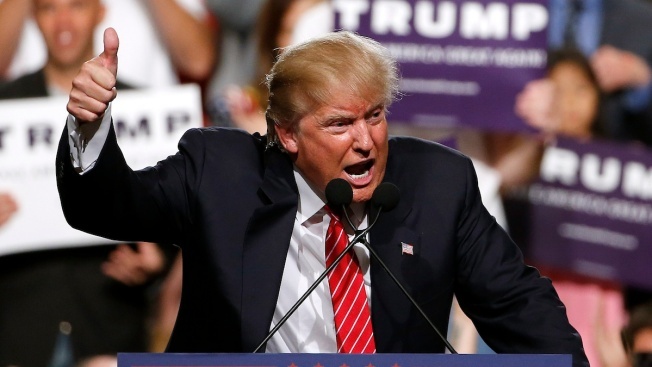 Trump has dominated the Republican presidential primary election in recent weeks, beginning when he described Mexican immigrants as rapists and criminals in his announcement speech last month. On Tuesday, he pulled a classic adolescent prank on a rival who dared to criticize him, a bit of payback reminiscent of writing the phone number of a nemesis on a wall with the message "Call me." Donald Trump calls fellow GOP Presidential hopeful Lindsey Graham an "idiot" and announces the Senator's private phone number during South Carolina campaign rally. After Sen. Lindsey Graham called Trump "the world's biggest jackass" during a television interview, the billionaire developer read Graham's personal cellphone number and showed it to TV cameras at a campaign event. In the Capitol on Wednesday, Graham was chatting on his flip phone as he rode the elevator. Asked if he would be getting a new one, he laughed and said yes. He later said he would be changing his number. Later, Sen. Sheldon Whitehouse, D-R.I., came up behind him, clapped a hand on his back and said, "I've been trying to call you, but I haven't been able to get through!" The back-and-forth is the latest chapter in an ongoing feud between Trump and those who criticize him. He is now at odds with much of the Republican establishment after a series of incendiary comments, topped by his weekend mocking of Arizona Sen. John McCain's experience as a tortured prisoner of war in Vietnam. Since then Trump has intensified his criticism of McCain and his record on veterans issues in the Senate, even as politicians from both parties and veterans groups have rushed to McCain's defense. The real estate developer also went after others who have criticized him in recent weeks, implying that former Texas Gov. Rick Perry was unintelligent and former Florida Gov. Jeb Bush weak. McCain sparked Trump's temper last week when the senator said the businessman's inflammatory remarks about Mexican immigrants had brought out the "crazies." McCain said Tuesday he would no longer respond to Trump's comments. Graham, a McCain friend and one of the 16 notable Republicans running for the presidential nomination, betrayed the growing exasperation and anger of many in the party when he appeared earlier on "CBS This Morning." He said Trump had "crossed the line with the American people" and predicted this would be "the beginning of the end with Donald Trump." Senator John McCain says Donald Trump owes an apology to all the prisoners of war he served with. 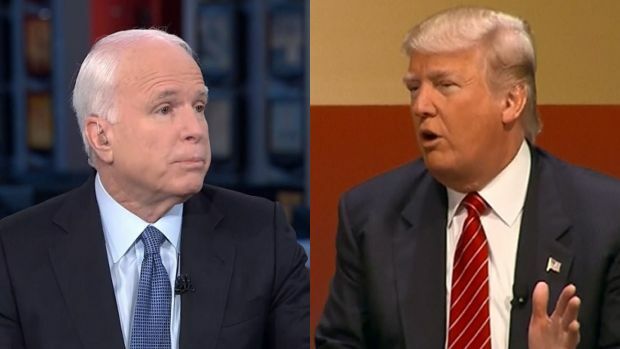 Trump recently stated that McCain is not a war hero, is only considered a war hero "because he was captured" and "I like people that weren't captured." McCain was reluctant to call himself a hero, but added that Trump's recent comments criticizing P.O.W. 's were "totally inappropriate." Trump responded during his speech by calling Graham an "idiot" and a "total lightweight," then held up a piece of paper and read out the senator's cellphone number to the capacity crowd of 540 people and the TV audience. He said Graham had given him the number several years ago when he'd asked him to put in a good word with a morning news show. "Give it a shot," Trump encouraged. "He won't fix anything, but at least he'll talk to you." Graham's voice mailbox was full Tuesday afternoon. Spokeswoman Brittany Brammell confirmed the number was his. Graham tweeted later: "Probably getting a new phone. iPhone or Android?" Elsewhere in South Carolina on Tuesday, one of Trump's rivals, former Florida Gov. Jeb Bush, walked a fine line, criticizing his fellow candidate's rhetoric on immigration and McCain but saying Trump's supporters are "good people" with "legitimate concerns." "I respect the sentiments people feel when they hear Trump talk. The problem with Mr. Trump's language is that it's divisive, it's ugly, it's mean-spirited," Bush told a gathering of Republican women in Spartanburg. "We have to separate him from the people that have legitimate concerns about the country." Another GOP rival, Rand Paul, was more dismissive. "People have to decide what's more important in trying to fix the country - real solutions or bombast," said the Kentucky senator. He predicted the GOP campaign will "get beyond the novelty of a reality TV star."